"My earliest literary influence was my mother, a great lover of books and frequenter of libraries. My name, Cinda, comes from her favorite character in a novel, House Divided [by Ben Ames Williams (1947)], about the Civil War. That Cinda was described as 'plain, and broad of face.' Ah, well. "I live in Ohio with my husband and college-age sons and an African Gray parrot. I teach at the University of Akron and write a freelance nutrition column for the Plain Dealer. I'm continually amazed that with my sorry start I'm working not one but TWO dream jobs-teaching and writing." How did the writing life first call to you? Did you shout, "yes!" Or run the other way? I began writing romance novels in middle school, starring me and all my friends. They were often confiscated by my English teacher, who didn't approve. I returned to writing seriously when my sons were small. I began with essays about parenting and family, and moved on to feature articles for local newspapers and magazines. Why did you decide to write for teens specifically? My sons were 13 and 16; they both liked to read fantasy (and so did I.) I had teenagers in and out of my house all day long. I guess I wanted to write the book that I wished had existed when I was their age. 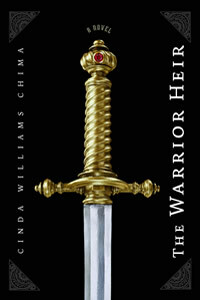 When I sat down to write The Warrior Heir (Hyperion, 2006), I had little more to draw upon than my lifetime as a reader and lover of story. As I got into it, I began hearing about various YA rules (like word count, oh, my) and I finally just decided to give the book the words it needed and see where it fit. Not something I'd recommend, but that's what I did. Could you tell us about your path to publication, any sprints or stumbles? When I finished WH, I began shopping it on my own while I wrote a sequel. It was a very slow process, because I followed all the rules (no simultaneous submissions, etc.) Over several years, I had some interest expressed by various publishers, did lots of revisions, learned a lot more about writing, and wrote two more novels. I've heard lots of debate about agent or no agent, but the key for me was finding a good agent. Congratulations on The Warrior Heir (Hyperion, 2006)(excerpt)! What was the initial inspiration for this book? There's this wonderful quote from Tolkien in which he says that ideas for stories come from the "leaf mold of the mind." And I think it's true: all of the experiences you have, the people you meet, the places you go: they all build into this rich humus that grows fiction. I had this notion about writing a truly American fantasy, set in a small Midwestern college town. Small towns are like laboratories: people interact who would never encounter each other in a big city. You can never escape your history in a small town. I wanted to write a fairly classic story about a young hero with room for growth: someone who considers himself ordinary, but learns he's capable of greatness in extraordinary circumstances. I love the idea of transformation--it makes me think I can transform myself. I've spent a lot of time prowling through graveyards and digging through dusty old records, uncovering family stories. My roots are in the Appalachians of southern Ohio, and there's a strong history of magic there. My grandmother was supposed to have had the "second sight"--she read the cards for people. When I was in college, I took an English literature tour to England: went to Stratford and the Lake District and the theatres in London. I incorporated elements of all of those things into Warrior Heir, and its sequel, The Wizard Heir (Hyperion, 2007). What was the timeline from spark to publication, and what were the major events along the way? I'd written four books over as many years, had left my first agent, and began the agent hunt again. I sent out 25 targeted queries to agents that I had researched. I received two positive responses, and signed with Michelle Wolfson of Ralph Vicinanza Ltd. Five years after I wrote my first draft of WH, it ended up going to auction. Like many writers, I find it challenging to decide where the story begins (in one early draft I found myself telling the story of how Jack's parents met!) I have a weakness for prologues. I'm enthralled with all my characters, so I have to remind myself to back off a bit on the adults and allow the young characters to stay center stage. Finally, logistically, it's a challenge to write novel-length fiction in the end bits of time, after working the day job. There are times I've literally ended up with my face on the keyboard. It's not for the faint hearted. Don't be a writer unless you must. If you must, then take it as seriously as any other profession. Do your homework. Learn the rules, and if you break them, do it for good reason. Find a good critique group. Get used to revision. It's very freeing to learn that you can drop a character, or change his gender, or change an ending-and the work isn't broken. It may improve. Revision is a creative process, too. Know that you're the one who cares the most about your book. How about those interested in writing fantasy specifically? Read widely in all genres, including fantasy. Start with the basics of story: character, setting, plot. If they don't work, it doesn't matter how much magic you layer in. It's not about the magic, after all, it's about the people. What is your favorite recent YA fantasy novel (other than your own) and why? Oh, dear. How to choose? I'll just say I read a wide variety of fantasy books, YA, MG, mainstream, and crossover. There's a list of books I've read on my Website. Some favorite fantasy authors are Tamora Pierce (love those strong female characters), Jonathan Stroud, Neil Gaiman, Alice Hoffman (tiny magical elements glittering like quartz in the sand, and you think, what just happened? ), Mercedes Lackey (timeless and ageless appeal), Libba Bray (author interview), Holly Black (author interview), Jo Rowling. In mainstream fantasy, I love George R.R. Martin. Plus I'm a LOTR nerd. I mean, I have a song from the movie as the ringtone on my phone. What do you do when you're not reading or writing? People ask my husband, When does Cinda write? and he says, All the time. Writing has displaced many things I used to do, but I'm hoping to get back to them. I have a large weaving loom, and love to spin and weave and quilt. At one time I was in a folk music band, and I'd love to pick up the guitar again. And I enjoy cooking and spending time with our family. The Wizard Heir (Hyperion Books for Children) is set for release in Spring 2007. The first chapter (PDF file) is posted to the website. And I'm working on a third YA fantasy.